Electricity Costs of a Rock Tumbler? Home » Rock Tumbling Library » Electricity Costs of a Rock Tumbler? We used a P3 "Kill A Watt" to monitor the cost of electricity used by our tumblers. 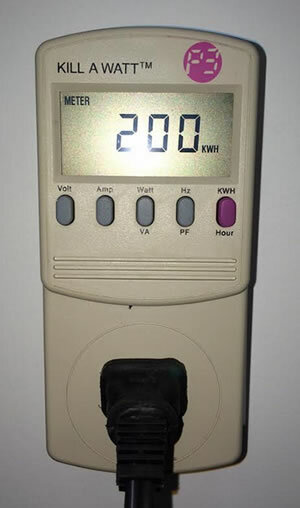 "The Kill A Watt" is a device that clocks how much electricity goes into the cord of your machine or appliance. Will it Run Up My Electricity Bill? "So, I am going to run this rock tumbler continuously, 24 hours a day, seven days a week, for at least a month. How much is that going to run up my electricity bill?" We understand why someone would ask this question. To answer it we purchased a "KILL A WATT" manufactured by P3 International. The "KILL A WATT" is a digital device that you plug into a wall outlet and then plug your rock tumbler (or any other appliance) into it. The "KILL A WATT" will then monitor how many kilowatts of electricity are consumed. 1) Which Tumbler: Some tumblers have tiny motors and use a small amount of electricity. Others have much larger motors and use a lot more electricity. 2) How Long You Tumble: The longer your tumbler is plugged in the more electricity you use. 3) Where You Live: We were surprised to learn that some people pay a LOT more for their electricity than others. If you live in Louisiana, the state with the lowest average cost of electricity per kilowatt hour, you will be paying about 6.9 cents per kilowatt hour. If you live in Hawaii, the state with the highest average cost of electricity, you will be paying a whopping 34.0 cents per kilowatt hour! Most of the tumblers that we sell (the Thumler's A-R1, A-R2, A-R6, and A-R12) have the same motor. That motor consumes almost exactly one kilowatt hour of electricity per day, running non-stop for 24 hours per day. The average cost of electricity in the United States is about 10 cents per kilowatt hour. On average, electricity costs of running one of these tumblers in the United States is going to be about 10 cents per day or $3.00 per month. So, running one of these rock tumbler's is going to take folding money out of your wallet every time you pay your electric bill. This table summarizes the number of kilowatts used by some of the rock tumblers that we sell per day and per month. If you multiply these numbers by your average cost of electricity per kilowatt hour the result will be the cost of running your tumbler per day or per month. The cost of electricity in the United States varies wildly. The state of Louisiana has some of the lowest electricity rates, averaging about 6.9 cents per kilowatt hour. The state or Hawaii has some of the highest rates averaging about 34 cents per kilowatt hour. The chart above shows the average cost of electricity by state during calendar year 2012 according to the Energy Information Administration. There is a tremendous range of electricity costs. This is one time you are glad that you don't live in Hawaii ! If you want to estimate the average monthly cost of running one of the tumblers listed in the table above in your state, here is how you can do it. Multiply the number of kilowatts per month used by the tumbler from the table above by the average electricity cost per kilowatt hour in your state from the table in the column at right. As an example, running the A-R1, A-R2, A-R6 or A-R12, that use about 29.62 kilowatt hours per month in Louisiana where the electricity costs 6.9 cents per kilowatt hour will cost about (29.62 x $0.069 = $2.04) two dollars and four cents per month. However, if you live in Hawaii and have to pay an outrageous 34.0 cents per kilowatt hour, running the A-R1, A-R2, A-R6 or A-R12 tumblers will cost about 34 cents per day or about $10.20 per month. Shockingly, running one of the Lot-o-Tumblers in Hawaii for a month will cost about $26.44 per month. Fortunately it will cost less than $8.00 per month in most other states. If you live in a state where the cost of electricity is spectacular, keep in mind that buying tumbled stones is often less expensive than running a tumbler. If you want full information about rock tumbling costs, including electricity, grit, polish and rough check out this article.